I know it’s actually January 15th, but the last time I was here, I was talking about Christmas love stories, so this is my first chance to welcome 2019 in with you! I love the beginning of the year. I am a calendar junkie, and one thing I do at the beginning of every year is take a large laminated wall calendar and write my writing schedule and publishing plans for the year on it. I have a lot of writing lined up for the next two years. One story in particular is on my mind, because the entire book takes place on a cruise ship. However, I’ve never been on a cruise before, so my husband and I talked about it and agreed that taking a cruise is a priority for me this year. The more we talked about it and the more we prayed about it, the more we knew that me taking a cruise alone is exactly what I need to do. I can experience all of the cruise-ish things I need to experience, arrange tours and interviews with staff, and get the experience I need to effectively write my book without having to make up too many details about my environment, and I can do it without being distracted by a companion. I’m apprehensive and intimidated: I’ve never been on a cruise, so all of it is an unknown. I will be alone, which is my preference, as I said, but it doesn’t make navigating through boarding and finding my cabin and all of the things that take place during a cruise easier. But, as I was talking to him, I was reminded of the time he was in Afghanistan and was able to take leave and meet me in Dubai. I traveled to Dubai alone – a western woman entering a Muslim country. I had to go through security and customs alone and had no idea what to expect, so I was a bit intimidated by the prospect. But it was easy. I had no issues. So much so that when he had the opportunity to take a class in Kuwait four months later, I flew to Kuwait alone to meet him and felt absolutely no trepidation about the trip — because it was no longer an unknown. So, if I’m honest, what intimidates me the most is the unknown — which is the reason I’m going in the first place, so that it will become known. Kinda of a vicious circle. I’m excited: I really enjoy being alone. But what I enjoy more than that is being alone in a crowd. One of my favorite things to do is to go to a shopping mall and just watch people. It’s fascinating to me and it feeds the writer inside of me in ways I cannot explain. So, the idea of being in a confined area for 7 nights with the same people — 7 nights as emotions ebb and flo, relationships experience stressors that come from being away from all things normal, excitement changes to boredom changes to excitement — to be alone in that crowd and to be able to sit back and watch and observe….I feel like I’m going to come out of it with SO MUCH character fodder that my curiosity about people will be abated for a long time. I’m excited about the opportunity to work – to work without wifi, to work without chores, to work without errands, to work without anyone expecting anything from me at any time for an entire week. For the last couple of years, my writing time receives regular interruptions — interruptions I allow and I’m not complaining. However, this is going to be amazing, because my focus for 2019 is to reclaim that writing time and to get back up to a production schedule I had four years ago. This trip will help retrain my brain to write when I need to write and focus only on writing at that time. I love learning new things, and this entire experience will be new to me. I can’t wait to see what I’ve managed to pick up during my week on the ship. I can’t wait to write this book. My fingers itch with the idea, with the concept, and I know my readers will love it. Research is tantamount to good writing. I learn better hands-on, so this type of research is really, really good for me. I plan to have a large notebook with me ready to write down all the story ideas I get from just all the people watching I get to do! Have you ever been on a cruise? What was your favorite part about it? Any tips for this first-timer? Anyone who leaves a comment on this post will be entered to win an autographed paperback of my book Courting Calla and will also be entered to win Inspy Romance’s monthly gift card giveaway! I never been on a cruise before. But I know people who have and they seem to like them. 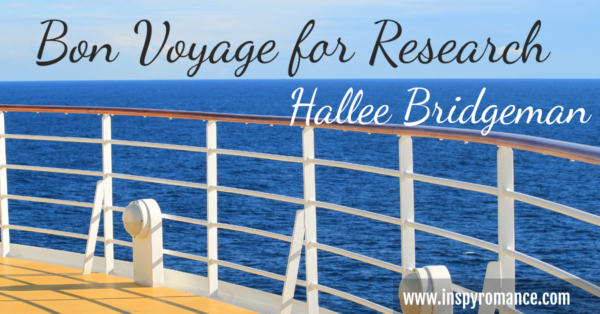 Hi Hallee, how exciting for you:) I have never been on a cruise, but my mum has and loves them. She loves that everything is on board and that she doesn’t have to cook or clean- she jokes that she needs to take a size larger clothes because of all the good food!! She loves the variety and mingling with people. I’m not a fan of mingling, but hopefully I’ll make a few connections! Hallee, sounds amazing! I am jealous and want to come with you! But I guess that would defeat the purpose. So… InspyRomance Authors cruise? Cause I’d be in. I have never been on a cruise, I get seasick so easily I am scared to try!! My hubs would love to go on one! Have fun, stay safe, and praying you have all the experiences you are looking for! I’m hoping working doesn’t make me seasick. It makes me airsick and car sick, so I’m really praying! Hi Hallee and Happy New Year! Even as a retiree, I enjoy the fresh start of a new year with a calendar. My wall calendar near my computer keeps the Oma (grandma) on track. In 1970 I went on a cruise with a girl friend on the MS Lord Selkirk II, a passenger cruise ship that sailed the Red River and Lake Winnipeg in Manitoba, Canada. Lake Winnipeg’s last cruise ship was the largest ever built between the Great Lakes and the Rockies, with accommodation for 130 passengers and 40 crew. As college students from the United States this was an adventure, spending 5 days on a cruise that Queen Elizabeth had been on the week before. Since I am not fond of crowds, I enjoyed the intimacy of this ship and meeting the other passengers. The best part of the cruise was observing the Northern Lights and visiting Norway House an Indian village above the Arctic Circle. Unfortunately in today’s world, cruise ships are getting larger and larger. MS Lord Selkirk II has been retired, so I have been exploring Viking Cruises on the Rhine River, which are smaller. Very difficult to find a ship with under 1,000 passengers. Having traveled by myself in the United States, Canada, Europe and Asia, I understand your feelings at this time – the apprehension, intimidation and the exhilaration. Best wishes. Bon voyage! What a neat kind of cruise! I hope your kiddo is well soon so you can go again! I’ve never been on a cruise. I think I would enjoy the food and not having to cook as well as the sights. Lord bless your time. I’ll look forward to your book. We just got home from our second cruise. They are fantastic!!! 1. The embarking process can be anxious, but if you remember to do all of your pre-boarding /check-in stuff, you breeze right through. We always get there about 9:30 or 10 regardless of when they tell us check in is. The cruise port people are on the ball and get you where you need to be, then you are in the first part of the boarding and get to spend more time on the ship. 2. Tell your waitstaff of any dietary restrictions…they will follow them all to a T and remember everything about you. 4. Excursions can be cheaper if you wait until you get off the boat and purchase them at port, but I am a planner and like to have all of our ducks in a row, especially in a place that is unfamiliar to us. 5. The staff love to have questions asked…we got to ask the cast of Grease tons of questions and go backstage and into the light and sound booth…for a theater family, this was fantastic!!!! Every staff on the boat has a story, and we love to hear about where they are from, their families, etc, and they love to talk about it. 6. The walls are magnetic, so take some magnetic clips to hang things. You are going alone, so space probably won’t be an issue. We always take extra hangars as well, but again, only one person. 7. Favorite part? We love it all!! Our last cruise was on a huge ship, mini-golf, Wave simulator, lazer tag, rock wall, water slide park, etc. and we never felt crowded or cramped. We love to just sit and watch the ocean, go to the shows, people watch, we just really, really love it!! Thank you so much, Alyson! You’ve helped with my excitement! We have been on one cruise. It was a short booze cruise and would never do that type of cruise again. It was before we had kids but it was still not really our thing. Tip. If you find yourself loving something when you sit down to eat, you can ask for as many helpings of it as you want! Let this be a time to try all sorts of new foods you would otherwise not eat! I would love to do an Alaskan cruise though! This one is not a booze cruise. In fact, alcohol is an added expense, and it’s pretty expensive! We did an Alaska cruise in 2010 at my husband’s suggestion. I was shocked, because he really doesn’t like a lot of people milling around him. We went with his mom, his sis and her hubby, and another sis-in-law, and spent some time with everyone and lots without. Because the weather was cool and wet (hello, west coast!) most cruisers seemed to stay inside a lot, and we spent hours on the promenade deck reading and whale watching! It was a good experience and we plan to do it again. We even had one booked in November 2017, but I had a heart attack less than two weeks prior so we had to cancel. Hallee, we’ve been on eleven ocean cruises and one river cruise. I get motion sickness, so I wear one of those patches behind my ear. Does the trick, and I have no sickness. Alyson gave you a lot of good advice. We book our shore excursions ahead, but we usually use a company not associated with the cruise line. Their excursions are usually cheaper. We had a private guide in Turkey, and the cost of the excursion for the two of us was less than the cost of one with the cruise ship where we would’ve been with 50 other people. You can find reviews of the excursions, so you know if you’re getting a good one. The site Cruise Critic is a good place to find out what other passengers have thought or done at a certain port. Have fun! A cruise is a different kind of vacation, they can be so much fun. You probably won’t get seasick, you barely feel the movement of the ship. It’s really beautiful being on the open water. I still can’t believe that I actually have been on 4 cruises because I am so afraid of the water. The food is great, the entertainment is very good and the ships are usually so luxurious. There’s a lot to see when you’re in port. Enjoy yourself and take a good book to read! I plan to write a good book during my week. :-) Thank you! You will love it!! We went on our first cruise last year and it was awesome. We took a Sealegs tablet the first night before bed, we didn’t feel sick just our brains felt of kilter. The Sealegs gave us a great nights sleep and next morning we woke up fully adjusted to the motion of the ship even on the rough day we didn’t feel sick (and I do get sea sick). With regards to the excersions, you do need to be careful, if you book one through the cruise ship the ship will wait for you (we were 50 minutes late leaving Vanuatu waiting for 6 people). But if you book one not through the cruise line they will leave you behind if you are late (3 people got left behind jn New Caladonea). So the higher price from the cruise ship is peace of mind. Otherwise if you book outside of the cruiseline take your passport on the shore excursions (unless you are in your country of residence). Get a balcony suite if you can, my husband and I can only handle crowds of people for so long then we need our own space. The balcony was a life saver as the rooms are tiny and we could sit outside or inside and look outside and it made our room feel much bigger. Enjoy, ps try to see as many shows as you can they are lots of fun too. I will look for Sealegs. Thank you! I’m pretty sure I’d be more intimidated than excited, because going alone is not for everyone. That being said, I’ve travelled alone a few times. While not great, it’s okay and I got to see new places and meet new people. I still prefer to travel with company. Though I’m not sure I’d have guts to board a ship for a day trip, even less a whole week. I love the ocean, but going away and staying in it for a long time sounds really really scary. I’m looking forward to your next post after the trip so maybe you’ll share. I didn’t enjoy going to Hawaii because I was an entire ocean away from my children — if the world ended, we’d be separated. (I’m only half joking. I think my love of action films is invading my reality.) So, hopefully, because my husband will be home with them, the being so far away on an ocean won’t feel so bad. I have never been on a cruise, but my friends that have gone on it say it is fun. I’ve been on two cruises. Which cruise line are you taking? We did Royal Caribbean and Princess. Royal Caribbean was excellent. No comment on the other. I echo what Alyson said. There will be staff waiting for you as you board to explain how to get to your room etc… They are all very welcoming and helpful. Regarding excursions be aware if you don’t book through the cruise line and you are not back when the ship is set to leave they will NOT wait for you. If you did book an excursion through them they WILL wait. I’ve seen people charter smaller boats to chase down the ship because they missed it! You are brave going alone, but then it sounds like you have the personality for it. :) It would be a nightmare for me. I hate being along when traveling. Love it at home though. I’ll be on Royal Caribbean! You’re going to have a wonderful time! I have been on a cruise but my husband has not. My two sisters and I hope to go on a cruise one day. A sister cruise would be a lot of fun! I totally understand your trepidation about experiencing the unknown because I’m very much the same way. I hope you have a great time on your cruise and everything goes smoothly. A cruise ship sounds like a fun setting for a book. Thank you! I can’t wait to write about it when I get back! I love going on cruises! We just got back from one a couple of days ago and I’m already trying to book my next one. We usually go with the adult kids and my parents, leaving from Florida and traveling the Caribbean. But last year my husband and I did a European one to celebrate our 30th anniversary and had a fabulous time! 3. Google before you go about your destinations – sometimes you might just want to walk around the port. Or get a taxi to a beach. Or go on an excursion. Since you are by yourself, the ships excursions might be pretty comparable to what you could find otherwise and you do have that guarantee that the ship will wait for you to get back. 4. Get your picture taken – multiple times! Then pick the one you like the best! The ship photographers are great and have multiple backdrops. You don’t pay for the picture unless you want to buy it. When our daughter was a teenager, she had a photo (or 5) at every backdrop – every night! Kept her busy! 5. Each cruise company has different ways of doing things – if you are going on Carnival, I can tell you a lot more. 6. Talk to the shopping expert – they are on the ship but aren’t really employed by the ship. 7. Check out the door decorations put up by repeat cruisers. 8. The waiters really don’t care if you order 2 appetizers and 2 entrees – so if you can’t decide, order both! 9. Read the cruise daily newsletter and figure out where the food is each day – sometimes we have discovered late in the cruise a place where they served food that we weren’t expecting (Cuban food in one bar, a salad bar in the adults only deck, bar-b-q on the promenade deck…). And learn what the specialty of the cruise line is – Carnival has great Chocolate melting cake (and great burgers at Guy’s Burgers), Celebrity has creme brulee every night. 10. Look for some hidden ducks. There is a FB page called “Cruising Ducks” and people take little rubber ducks with notes attached to them on board and hide them in public places (but not stores) for people to find. 11. Tell the Cruise Director that you are researching for a book and ask if you can observe any of the extra parties – they have them for the repeat customers – and they are interesting. 12. For the past couple of cruises we have purchased the social media wifi package – which means we are not completely cut off and can have text chats via FB and Whatsapp if we need to contact people at home – just no emails or direct texting. It isn’t that expensive. Have a WONDERFUL time! Personally, I like cruising with my family but you will so enjoy your research! I cannot wait to read your book! Oh this book already sounds fascinating! I’ve always wanted to go on the KLOVE cruise because it occurs every year on the week of my birthday (which is next week). Maybe someday :)) My hub and I also considered going on a shorter 3 day cruise but they’re harder to find and book. And I would LOVE to go on a 7 day trip anywhere and just write my heart out. That sounds exhilarating :) BUT I also love being with people and being alone is not typically my thing. Have a great time. I’m excited for you! The K-Love cruise always sounds like fun! I’ll check it out – thank you! Never been on a cruise maybe one day soon though. My husband would like to take a land sea cruise excursion to Alaska. That would be a beautiful cruise! I’ve never been on a cruise. My husband was in the navy and spent a lot of time on board the aircraft carrier, USS Eisenhower. He refuses to even consider a cruise! ;-) It’s not on my list of priorities either but I think it could be fun. I hope you have a great and fruitful time. So fun to read everyone else’s comments! I didn’t comment yesterday because our power was out for awhile due to a storm! Anyway, I’ve never been on a cruise. The only one I’m really interested in is an Alaskan cruise. We’ll see. Anyway, I’m looking forward to a full report!! An Alaskan cruise would be beautiful! I have never been on a cruise. However, I have friends that take a different cruise almost every year. In 2019 they plan to travel the Panama Canal. Enjoy your time away.